Last night, Nintendo of Japan assaulted us with details on the Nintendo 3DS, which we won't get our hands on until early next year. Amidst the new games and new features were buried some lower-key but still impressive details. Sure, Tag Mode, automatic Mii creation and Augmented Reality features get all the glory, but the Nintendo 3DS has a couple other tricks up its sleeve. First is the Nintendo 3DS's web browser, which unlike the Nintendo DS web browser, sounds pleasantly useful. 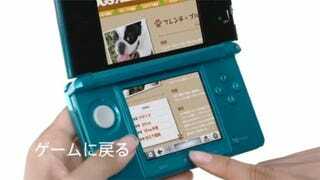 According to the company, the 3DS Web Browser can be used during game play, letting players hop online then jump back into games quickly. Perfect for FAQ checking! Second—and perhaps less exciting—is the Nintendo 3DS's Activity Log, which acts as a pedometer that tracks your walking while carrying the handheld (and while wearing cool pants). The Activity Log also charts how much time you play the 3DS and how long you play games on the device. To see everything else the Nintendo 3DS can do, read our recent coverage of Nintendo's conference.